2. Location – I’m originally from the mid-west but grew up as a Navy brat living all over the United States. I’ve lived in Austin, Texas for the last 11 years. 3. How did you get into gaming? – I have always loved games and stories. My mom read stories to me every day and would play me songs on her guitar. I was obsessed with movie The Yellow Submarine, and I still am. The songs and scenes are fantastical and while at first I thought the world it was set in was just zany and had no rules. As I watched it repeatedly I realized it DID have rules, they were just different. A lot of the time the characters just seemed to make up their own rules as well…I really liked that idea. When I was 5 I took a train with my mom. I already loved games by then. I played a lot of Don’t Break the Ice, Don’t Spill the Beans, Ants in the Pants, Sorry, Trouble…the list goes on. My mom played the card game War with me, but it was the second day of this trip and I was bored. I was always complaining about being bored back then. Across from us I saw two young men take out a board with a map on it and little figures. They had books and were reading each other a story about a vampire and a graveyard. I really wanted to play that game. My mother had played D&D (Dungeons and Dragons) a time or two growing up, and after she asked them about it they helped me make my own character. I was so excited by the idea that I could name my character and be anything I wanted…I was hooked within 5 minutes. I don’t know how long I played, but I was sad when we had to go. See more about Elly’s background and why she chose Streamlined Gaming. 2. When was the first time you remember wanting to create a game of your own? – I didn’t really think about making my own game until I was in my late 20s. My friends and I had started having regular board game nights instead of just Table Top RPGs (Role Playing Games) such as D&D. I got hooked again as our collection or board games steadily grew. 3. What steps did you take in planning out your game? – I mostly thought about ideas. 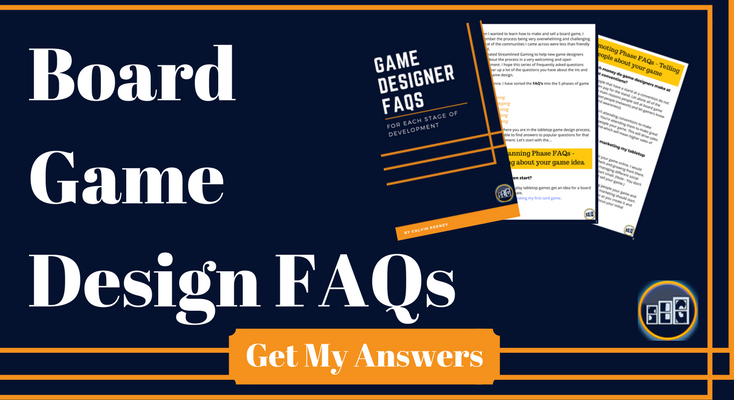 I didn’t know how to go about actually MAKING a game, so I would think and think about rules and how it might be played and what people might like and what would need to be fixed. I would keep thinking until another idea came along. One always would and then I would drop the previous idea to think about the next. I’ve forgotten most of my ideas over the years to be honest. At the time I didn’t see making my own game as a realistic goal, I just liked to think about ideas for new ones. 2. Why did you set out to create your first game? – I love playing games. I feel like the process of making a game is a natural evolution of playing games. I have read so many rulebooks…it didn’t seem like it would be a big leap to try to write one. 3. What is your favorite aspect of game design? – I have different preferences based on what I am in the mood for. I love theme and story woven together with rules. I want a reason WHY I, as a player, or my character is doing something or wants something…and then I want rules that thematically tell me how to accomplish my goal or lose trying. I’m not an especially competitive person. I love to play, and I try to win…because I like to ‘figure out’ the game and the rules. But I still enjoy losing a good, well balanced game that provides me with motivation a lot more than winning a game that I’m not invested in. I like coming up with motivation, thematics and mechanics together because I feel it makes me think harder about unique mechanics that fit my theme rather than forcing a theme onto mechanics. On the other hand, I’ll be honest. I love a good party game…I like the challenge of trying to come up with something anyone can join in on and have a good time. Building them, for me, is more about setting up other people to be creative but the “play” and fun comes from the players unique perspectives. It can be hard to make something that draws that out of people consistently without becoming too repetitive. 4. What is your least favorite part of game design? – Trying to get the rules out of my head and onto paper. Sometimes things come together perfectly in my head, or at least I think they do, and I forget my “Aha!” moment before I write it down. Thanks for reading the Elly Cape Interview. If you have any additional questions for her, ask them in the comments below.